Text: Origins. One of the everlasting purposes of the liturgical church year is the opportunity for and necessity of biblical instruction in the fundamentals of the life of Christ, with Christmas representing the Incarnation of the second person of the Trinity. 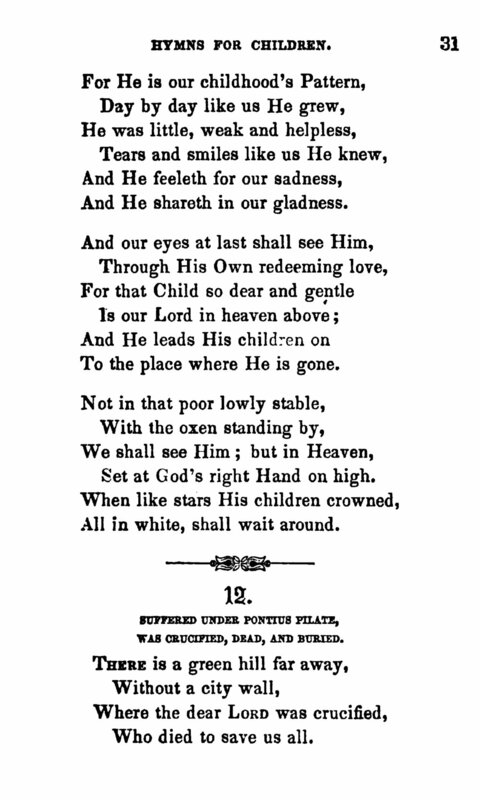 These fundamentals are also expressed in the Apostles’ Creed, which served as the foundation for a series of thirteen hymns crafted by Cecil Frances Alexander (1818–1895), published together in her collection Hymns for Little Children (London: Joseph Masters, 1848). The fourth of these is “Once in royal David’s city,” based on the part of the creed that reads “who was conceived by the Holy Ghost, born of the virgin Mary.” The original text was published in six stanzas of six lines, without music. Fig. 1. Hymns for Little Children, 4th ed. (London: Joseph Masters, 1850). For one thing, she uses simple language which a child can understand. For another, she writes the sort of poetry which a child can easily learn and remember. Most important of all, she seeks to capture interest by appealing to the imagination. She does not begin a hymn with abstract theology: that would only puzzle or bore a child. She begins by painting a picture, by telling a story, and against that background she develops her teaching. The text, as cherished and beautiful as it is, has also had its share of criticism. The most common complaint is in relation to the end of stanza three, “Christian children all must be mild, obedient, good as He,” which might strike some listeners as being somewhat outmoded or naive, but in all fairness to Mrs. Alexander, parents and teachers still desire for their children to be respectful and peaceable and kind to the best of their abilities. Other more nuanced complaints might arise out of the depiction of Christ in a “cattle shed” or “stable,” as some scholars insist that the original Greek biblical text, Israeli archaeology, and cultural practice would have put Jesus in a bed of hay near animals, yes, but in the common area of a Jewish home, not a in stable, because “there was no place for them in the (upper room or guest room)” (Luke 2:7). This detail will go unnoticed by some, decried by others. Some collections change “maiden” to “mother” to avoid the doctrinal concerns of Mary’s lifelong virginity, generally celebrated by Catholics and the Orthodox but denied by Protestants. Tune: This hymn is sung almost exclusively to the tune written for it by Henry J. Gauntlett (1805–1876), first published in a small series, Christmas Carols (London: Joseph Masters, 1849 | Fig. 2). “Once in royal David’s city” was the first of the four carols in the series. Fig. 2. Christmas Carols, No. 1 (London: Joseph Masters, 1849). Both text and tune were then included in Gauntlett’s musical edition of Hymns for Little Children (London: Joseph Masters, 1858 | 1872 ed. shown at Fig. 3), for unison voices and piano/organ accompaniment. Being from the same publisher, the pages are nearly identical from the 1849 printing, except for the title; the music was probably run from the same plates. Fig. 3. Hymns for Little Children (London: Joseph Masters, 1872). Gauntlett prepared a four-part harmonization for the Appendix of Hymns Ancient & Modern (London: William Clowes & Sons, 1868 | Fig. 4), where the tune was dubbed IRBY (in the index) for unknown reasons. Fig. 4. Hymns Ancient & Modern with Appendix (London: William Clowes & Sons, 1868). “Once in royal David’s city” is known famously by its annual performance at King’s College, Cambridge, in their Nine Lessons & Carols service, utilizing an arrangement by Arthur Henry Mann (1850–1929). Of this experience, J.R. Watson has said, “The singing of the first verse as a solo on such an occasion can provide a moment of beauty that is unsurpassed in hymn-singing.” Mann’s arrangement was published as sheet music for Novello in 1957 and subsequently included in Carols for Choirs (Oxford: University Press, 1961 | Fig. 5). Some hymnals use Mann’s harmonization in place of or in addition to Gauntlett’s. Fig. 5. Carols for Choirs (Oxford: University Press, ©1961), excerpt. Erik Routley, “Once in royal David’s city,” Hymns and the Faith (London: John Murray, 1955), p. 106. Frank Colquhoun, “Once in royal David’s city,” Hymns that Live (Downers Grove: Intervarsity Press, 1980), p. 47. “Once in royal David’s city,” New Oxford Book of Carols, ed. Hugh Keyte & Andrew Parrott (Oxford: University Press, 1992), pp. 330-332. May B. Daw & Raymond Glover, “Once in royal David’s city,” The Hymnal 1982 Companion, vol. 3A (NY: Church Hymnal Corp., 1994), no. 102. “Once in royal David’s city,” Companion to Church Hymnal, ed. Edward Darling & Donald Davidson (Dublin: Columba Press, 2005), pp. 271-272. Paul Westermeyer, “Once in royal David’s city,” Hymnal Companion to Evangelical Lutheran Worship (Minneapolis: Augsburg Fortress, 2010), pp. 43-44. Carl P. Daw Jr. “Once in royal David’s city,” Glory to God: A Companion (Louisville: Westminster John Knox, 2016), pp. 146-147.